A leader is a named character that leads a significant part of the Empire, as Governor, Scientist, Admiral or General. The ruler is a specific subtype of Leader and in many cases elected from the existing leaders. The name of a leader can be changed at any time by clicking on it. All values in this section can be modified by leader traits, edicts, technology, policies, traditions, civics and ruler traits. Leaders other than Rulers may be dismissed at any time. Dismissal is irreversible. While some events and diplomatic options may give leaders, the most common way to get leaders is to recruit them from the leader pool. There is one pool for each type of leader, other than Rulers, who cannot be recruited directly. The default size of the pool is 3, but this can be increased by the Meritocracy or Pooled Knowledge civics. When a leader is recruited, a replacement in the leader pool is generated immediately. Thus, it is possible (though potentially expensive) to "re-roll" leaders in the pool by recruiting and immediately dismissing leaders. Alternatively, leaders in the pool are replaced automatically after 10 years. Once recruited, leaders can be freely assigned to different posts (for example, moving a governor from one planet to another sector) - taking a few days to arrive at the new location - be left without an assignment, or be dismissed. Each leader has an age in years, which is between 28 and 50 when they are first generated (18-26 for heirs). Leaders have a base guaranteed lifespan of 80 years. Life expectancy can be improved by picking the traits Enduring or Venerable during species set-up and by researching certain technologies, picking certain traditions; or worsened by picking Fleeting during species set-up. Synthetics and certain other cases can make a leader immortal. Certain event resolution choices can also grant an increase in lifespan for all leaders. After passing their guaranteed lifespan, leaders have a chance of dying every month. The probability is 0.2% per year that has passed since their guaranteed lifespan. After 20 years past their guaranteed lifespan this increases to 2% per year. The mean lifespan with no modifiers is 88 years, 6 months. Hovering over a leader's age will show the species' guaranteed lifespan. Leaders that have the Mechanical, Machine, Hive-Minded and Chosen One will never die from old age. The skill level of a leader determines their basic bonuses, which depend on leader type (ruler, governor, etc.). By default, skill ranges from a minimum of 1 to a maximum of 5. The skill cap can be increased to a max level of 10 through certain traits, civics, and the leader enhancement policy. A leader's skill increases after accumulating a certain number of experience points, shown in the table below. Upon gaining a level, a leader's experience total resets to 0 and they have a chance to gain a leader trait. Leaders are divided into 5 classes that determines their possible assignments, bonuses, experience sources and available traits. Non-Ruler Leaders are generated with one pre-existing trait suitable for their class. Every time a Leader gains a level, they have a chance to receive an additional trait, provided they do not already have 3 traits. Any Adaptable +25% Leader Experience Gain Biological This leader is quick to adapt new methods and ideas if they prove superior. Any Resilient +25 years Leader Lifespan Biological This leader is resilient and in excellent physical condition, dramatically increasing life expectancy. -50% Leader Upkeep Biological This leader is particularly eager for an assignment. Any Flexible Programming +25% Leader Experience Gain Robotic This leader has unusually flexible programming, and is capable of quickly adapting new methods and procedures if they prove superior. -50% Leader Upkeep Robotic This leader was only recently upgraded to a sufficiently autonomous state to allow for command positions. Any Increased Lifespan +40 years Leader Lifespan Biological Shroud event The powerful psionic energies of the Shroud have slowed the natural aging process of this leader. Any Arrested Development -1000% Leader Experience Gain Any The personal development and skills of this leader seem to have plateaued at their present level. Any Stubborn -25% Leader Experience Gain Biological This leader is stubborn and slow to accept new methods and ideas, even if they have proven superior. Any Rigid Programming -25% Leader Experience Gain Robotic This leader has particularly rigid programming that only rarely permits behavioral modifications, even when such changes would improve efficiency. Any Substance Abuser -20 years Leader Lifespan Biological This leader has fallen to substance abuse to cope with the stress, which has had a detrimental effect on physical health. +10% Planet Building Speed Biological This leader is an architect at heart, investing in more efficient construction practices. Champion of the People +5% Happiness Biological This leader seems really to be concerned about the welfare of his people. +20% Edict Duration Biological This leader is exceptionally charismatic, enforcing their will with ease. Deep Connections +1 Monthly Influence Biological Planetary Unification technology This leader is firmly entrenched in the labyrinthine web that makes up the polictical machine. −15% Starbase Influence Cost Biological This leader aims to expand their borders, reducing the Outpost build cost and Colony Influence cost. +33% Anomaly Research Speed Biological This leader is known for their insatiable curiosity, valuing space exploration above all else. +20% Leader Experience Gain Biological Galactic Administration technology This leader is considered to be unusually perceptive, spotting talent where others see only eccentricity or incompetence. +5% Pop Growth Speed Biological This leader feels strongly about securing and protecting agrarian food sources. Fleet Organizer +15% Naval Capacity Biological Doctrine: Reactive Formations technology This leader is an expert at organization possessing the necessary micromanagement skills to command very large starship formations. −33% Defense Platform Build Cost Biological Deep Space Outposts technology This ruler understands the value in using military station to secure territory. +33% Army Experience Gain Biological Combat Training technology This leader rose through the ranks of military command. +25% Colony Development Speed Biological New Worlds Protocol technology This leader is eager to reign over distant stars. −10% Starbase Upgrade Cost Biological This leader reaches for the stars. Industrialist +10% Minerals from Jobs Biological This leader has a firm grip on the means of production. Investor +10% Trade Value Biological This leader is a shrewd economist, capable of maximizing financial potential. −10% Army Upkeep Biological Doctrine: Fleet Support technology This leader is well aware of the importance of properly-structured supply chains. −10% Shipyard Build Cost Biological Doctrine: Refit Standards technology This leader is enthusiastic about advancements in military technology and ship construction. −20% Army Cost Biological Centralized Command technology This leader is particularly charismatic, and fresh recruits are practically lining up to serve their nation. Reformer +10% Monthly Unity Biological This leader is a reformer, dedicated towards building the society of tomorrow. −25% Mining Station Build Cost Biological This leader recognizes just how vital the exploitation of offworld resources is for a star nation. +10% Army Damage Biological This leader does not shy away from conflict reducing the Cede Planet and Cede Frontier Outpost War Demand Costs. −15% Clear Blocker Cost Biological Terrestrial Sculpting technology This leader seeks to remake worlds in their image. Corvette Focus −20% Corvette Build Cost Biological Destroyers technology This leader is intent on promoting the construction of Corvettes. Destroyer Focus −20% Destroyer Build Cost Biological Destroyers technology This leader is intent on promoting the construction of Destroyers. Cruiser Focus −20% Cruiser Build Cost Biological Cruisers technology This leader is intent on promoting the construction of Cruisers. Battleship Focus −20% Battleship Build Cost Biological Battleships technology This leader is intent on promoting the construction of Battleships. Hive Mind Immortal Biological Hive Mind This leader is the immortal nexus of the vast cognitive apparatus that constitutes a Hive Mind. Machine Intelligence Immortal Robotic Machine Intelligence This leader is the core intelligence that oversees and directs all actions in a Machine Empire. Agrarian Upbringing +10% Food from Jobs Biological This leader was raised around hydroponic farms, and has several ideas on how agrarian yields may be improved. +10% Planet Build Speed Biological This leader is an architect at heart, investing in more efficient construction practices. +20% Defense Army Damage Biological Centralized Command technology This leader is a veteran of the armed forces, with intimate experience of its structural inefficiencies. −25% Clear Blocker Time Biological This leader has a background in landscaping, eventually turning their attention towards larger projects. Iron Fist +10% Slave Output Biological Allowed Slavery policy This leader is infamous for their ruthless pursuit of efficiency, and is capable of getting the most out of slave labor. Intellectual +10% Research from Jobs Biological This leader is naturally inclined towards the sciences, and seeks to foster a curiosity about the natural world in their subjects. −10% Shipyard Build Cost Biological Interstellar Fleet Traditions technology This leader is a former fleet officer, and is personally invested in promoting a strong inter-planetary presence. Righteous -25 Crime Biological This leader is incorruptable and harbors strong convictions regarding what is right and wrong. −10% Shipyard Build Cost Robotic Interstellar Fleet Traditions technology This leader constantly runs theoretical models on a secondary memory core for the purpose of improving starship construction efficiency. Analytical +10% Research Output Robotic This leader devotes an unusually large percentage of its processing power towards analyzing the natural sciences and promoting their study to others. −25% Clear Blocker Time Robotic This leader has mastered the art of quickly and efficiently transforming alien terrain into a parking lot. +20% Defense Army Damage Robotic Centralized Command technology This leader has an unusual interest in warbot design, and is constantly improving and tinkering with our existing models. Corrupt +25 Crime Biological This corrupt leader is willing to sell out anyone and anything if it increases their personal wealth. Waste Management Specialist -10% Building Upkeep Biological Racket Industrial Enterprise leaders This leader has an almost uncanny ability to reduce and repurpose industrial waste. How do they do it? It's best not to ask. Enclave Trader +10% Trade Value Biological Hired from a Trader Enclave Recruited from one of the independent merchant Enclaves, this leader is particularly adept at maximizing Trade value. Immortal Gray L-Cluster outcome Gray is in reality a dense swarm of billions upon billions of advanced nanites. Archaeologist +50% Precursor Anomaly Research Speed Any This leader excels at the study of alien artifacts and structural remnants in the field. Carefree +35% Anomaly Research Speed Any This leader is perhaps less meticulous than others. Improved draw chance for dangerous technologies Any This leader pursues their research with unusual fervor. Meticulous +10% Anomaly Discovery Chance Any This leader is thorough in their examinations of unknown phenomena. Improved draw chance for rare technologies Any This leader is prone to sudden bursts of inspiration. Cataloguer +25% Survey Speed Robotic This leader can conceive no greater calling that to catalog the entirety of the universe. Roamer +25% Survey Speed Biological This leader was born to roam the stars. Expertise: Computing +15% Research speed (Computing) Any Each Scientist can only have one expertise trait This leader is, following years of study, considered an expert within the field of Computing. Expertise: Field Manipulation +15% Research speed (Field Manipulation) Any Each Scientist can only have one expertise trait This leader is, following years of study, considered an expert within the field of Field Manipulation. Expertise: Particles +15% Research speed (Particles) Any Each Scientist can only have one expertise trait This leader is, following years of study, considered an expert within the field of Particles. Expertise: Industry +15% Research speed (Industry) Any Each Scientist can only have one expertise trait This leader is, following years of study, considered an expert within the field of Industry. Expertise: Materials +15% Research speed (Materials) Any Each Scientist can only have one expertise trait This leader is, following years of study, considered an expert within the field of Materials. Expertise: Rocketry +15% Research speed (Rocketry) Any Each Scientist can only have one expertise trait This leader is, following years of study, considered an expert within the field of Rocketry. Expertise: Voidcraft +15% Research speed (Voidcraft) Any Each Scientist can only have one expertise trait This leader is, following years of study, considered an expert within the field of Voidcraft. Expertise: Biology +15% Research speed (Biology) Any Each Scientist can only have one expertise trait This leader is, following years of study, considered an expert within the field of Biology. Expertise: Military Theory +15% Research speed (Military Theory) Any Each Scientist can only have one expertise trait A sound understanding in the craft of war gives this leader innovating insight into the process of military reform. 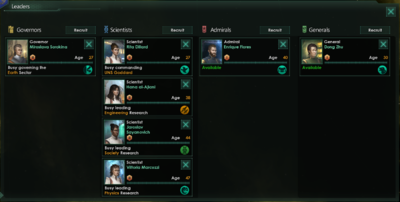 Expertise: New Worlds +15% Research speed (New Worlds) Any Each Scientist can only have one expertise trait This leader is, following years of study, considered an expert on settling on New Worlds. Expertise: Statecraft +15% Research speed (Statecraft) Any Each Scientist can only have one expertise trait This leader is, following years of study, considered an expert within the field of Statecraft. Expertise: Psionics +15% Research speed (Psionics) Biological Each Scientist can only have one expertise trait This leader is, following years of study, considered an expert within the field of Psionics. +15% Anomaly Research Speed Biological Self-Evolving Logic technology This leader has created a simple neural network to help with data processing tasks. +30% Anomaly Research Speed Biological Positronic AI technology This leader has created a complex neural network capable of independent decision-making and even introspection. −10% Anomaly Research Speed Biological This leader is unwilling to collaborate with others. Towel-bearer +40% Survey Speed Biological Stay Calm anomaly event A towel has immense psychological value. Improved draw chance for rare technologies Biological Hired from a Curator Enclave This leader hails from the Curator enclave. His understanding of technology and exploration is unmatched. +10% Sublight Speed Any Can be gained from victories This leader is an agressive admiral, always looking to pour as much fire on the enemy as possible within the least amount of time. Cautious +20% Weapons Range Any Can be gained from defeats This leader is a cautious admiral, avoiding unnecessary risks and taking care to always maintain in which fleet units can mutually support each other against the enemy. +0.5% Daily Armor Regeneration Any Can be gained from repairs This leader is a natural engineer, having the knowledge and skills to organize and oversee starship repairs without the benefit of a spacedock. +20% Sublight Speed Any Can be gained from space battles This leader believes that speed and rapid maneuvers are the keys to success in any space engagement. +10% Sublight Speed Any Can be gained from leading a fleet This leader is an expert in reconnaissance, having the technical skill to always get the most out of long-range starship sensors. +25% Combat Disengagement Chance Any Can be gained from victories This leader fights deviously, relying on misdirection and surprise to get the better of the enemy. -33% Combat Disengagement Chance Any Can be gained from space battles This leader refuses to even consider the possibility of retreat when battle has been joined, preferring instead to fight to the death if necessary. −10% Sublight Speed Any Can be gained from defeats This leader is slow and indolent, performing duties with little energy or initiative. Nervous -10% Fire Rate Any Can be gained from defeats This leader is nervous and apprehensive and can be easily overwhelmed in the minutia involved in handling large formations of starships. +10% Fire Rate Any Defeating the Ether Drake This Admiral has proven themselves in fierce combat. Foredoomed to a Rendezvous +25% Sublight Speed Biological A Rendezvous Horizon Signal Event Experienced a troubling future. +10% Fire Rate Marauder Rescued or hired for 2000 Energy This Leader hails from a space-based warrior culture, and has been taught unorthodox hit-and-run tactics from an early age. -33% Combat Disengagement Chance Reth Unddol Defeating the Tiyanki Matriarch When it comes to warfare, this leader is mercilessly obsessive, and singular in purpose. +20% Damage to the Contingency Cybrex This Cybrex leader is equipped with ancient tactical databases from their civilization's violent past. Dimensional Stutter +20% Sublight Speed Extradimensional For unknown reasons, the vessels under the command of this extradimensional fleet lord seem to rapidly stutter in and out of existence as they move, which has the effect of increasing their sublight speeds. Ethereal +20% Evasion Extradimensional Some extradimensional fleet lords have learned to use the ethereal nature of their vessels to greatly enhance their evasive capabilities in combat. Hive Affinity +20% Fire Rate Prethoryn The Prethoryn creatures operating under this fleet consciousness have managed to attain an unusual level of affinity to one another. Their firing discipline has greatly improved, leading to a higher rate of fire. Sentinel Training +20% Damage to Prethoryn Creatures Sentinel Sentinel fleet commanders possess detailed knowledge of Prethoryn anatomy and tactics. Void Hunter +20% Sublight Speed Prethoryn The hunting instincts of this fleet consciousness has driven the Prethoryn creatures under its dominion into a frenzy. Their eagerness for battle drives them ever forward. +0.5% daily armor regeneration Great Khan The Great Khan is a charismatic leader, a brilliant tactician, and, if the rumors are true, a powerful psychic. +33% Collateral Damage Any This leader is particularly skilled at inflicting casualties on the enemy, offering no quarter and expecting none in return. Army Logistician −20% Army Upkeep Biological This leader can seemingly conjure up supplies from nowhere, decreasing the maintenance costs of ground forces. Charismatic +25% Army Morale Biological This inspiring leader has an undeniable charisma, being worshiped as a hero by the troops. +5% Army Damage Biological This leader is always in the thick of it, bucking the spirits of the troops by leading from the front despite the risks involved. -33% Collateral Damage Biological This leader is unusually concerned with the lives of others, taking care to avoid unnecessary deaths among their own soldiers as well as any civilians caught in the fighting. Demoralizer +30% Army Morale Damage Robotic This leader is fascinated by the fragile minds of organics, and how they can most efficiently be broken through the creative use of terror tactics on the battlefield. -10% Army Damage Biological This leader commands from the rear, preferably as far away from the frontlines as possible to avoid exposure to 'unnecessary dangers'. Erratic Morality Core -10% Army Damage Robotic This leader frequently suffers intense bouts of shame and regret over enemy casualties due to an erratic morality core. Mercenary Warrior +10% Army Damage Marauder Hired for 2000 Energy This Leader hails from a space-based warrior culture, and has been taught unorthodox hit-and-run tactics from an early age. Available only with the Utopia DLC or the Distant Stars DLC enabled. Certain species traits grant leaders a unique trait that offers different benefits depending on the leader type. There are two possible accidents for each leader class, both irreparably damaging it. Note that this is rolled per empire, not per leader. For a role with exactly one leader, this represents a mean active lifespan of 500 years. Available only with the Synthetic Dawn DLC enabled. The Self-Preservation Protocols Tradition reduces the weight of accidents by half, reducing the chance for an accident to occur for each role to 1.06% (6.38% total), for a mean active lifespan of 940 years. The Tradition is only available to Machine Intelligence empires. This page was last edited on 25 March 2019, at 13:46.